← I’m going to the opening of “This is Your World” at Gallery Carte Blanche Friday. Are you? I’m going to Pop-Up Magazine on Wednesday. Are you? I’ve never been to Pop-Up Mag because my internet connection isn’t fast enough for me to buy tickets in the first nano-second after they go on sale, and then it’s too late. 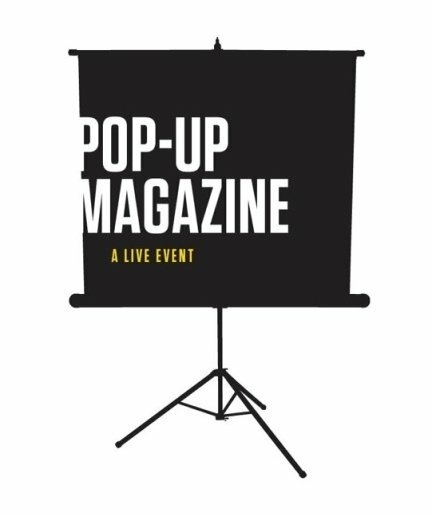 My understanding of what Pop-Up Mag actually is is incomplete; dubbed a “live magazine,” it features writers, journalists, radio producers, filmmakers, and artists presenting their content once before an audience in an unrecorded, undocumented performance (no recording devices allowed, even by the press!). There is never any cohesive theme; rather the roster of past presenters and their subjects reads as a list of anyone who’s anyone in American arts, letters, entertainment, tech, business, and leisure, exploring everything relevant and fascinating in our culture. Author Rebecca Solnit talked about Hitchcock and Muybridge. The late photographer Larry Sultan presented “A Soldier’s Tale” in the biography section. Mother Jones powerhouse Mac MacLelland presented on foreign affairs. New Yorker staffer Dana Goodyear talked about food. Wired‘s Steven Leckart presented gadgets and artist Jason Polan, portraits. You see I can tell you very little about these past acts; Pop-Up Mag is serious about the event being a stand-alone, once-in-a-lifetime occurrence, experienced only with the people witnessing it for the 90 minutes of its duration. That mystery might be frustrating for people not lucky enough to have scored tickets and who have only heard of the awesomeness of the event, which sounds like a genius hybrid of theatre and journalism. I’m especially excited; I wish all my favorite magazines did this instead of sending me issues that I can read at my convenience and therefore leave in unread piles at the foot of my bed, where they mock me while I’m staring at facebook (I mean you, Believer!! Your combination of brilliance and ignorability is forcing me to face my own combination of superb taste and laziness, and that’s the job of books, season five of Mad Men, and Wagner’s Ring cycle.) It also incorporates into what is usually a solitary event the best part of what theatre has to offer: the ritualized collective experience. While reading on one’s own has its joys, there’s something especially moving about sitting in a room, seeing and listening to something that exists only in that moment for the people present, shared in real time, irreplicable, unrepeatable. I have my ticket. ENVY ME NOW. This entry was posted in EVENTS, publishing, San Francisco, theatre and tagged authors, journalism, literary events, magazines, pop-up mag, pop-up magazine, San Francisco, theatre. Bookmark the permalink. 2 Responses to I’m going to Pop-Up Magazine on Wednesday. Are you?